I can honestly say that when I started blogging about the ukulele, I never once thought I would find myself writing about food. 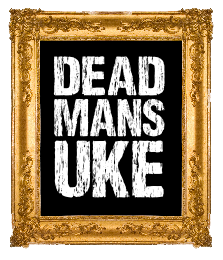 Until that is UK act Dead Mans Uke came along with a gem of a merchandise idea. Flaming Formby Habenero Hot Sauce! Tim and Jake Smithies of Dead Mans Uke came up with the novel idea recently, and via the culinary skills of the Cambridge Chili Sauce Co, presented me with this bottle of Dead Mans Uke brand sauce at the last N'Ukefest. "Dead Mans Uke cannot be held responsible for any damage or pain caused..."
It's not all heat heat heat though, and has a fruity and slightly sweet taste too. I've had it with cheese and it goes down a treat, as it did on grilled chicken, and my wife mixed it with mayo to create a chili dip! You can pick up your bottles via the Dead Mans Uke website at http://www.deadmansuke.com/flaming-formby/ and be sure to check the band out too. They absolutely rocked the crowd at N'Ukefest 2014!